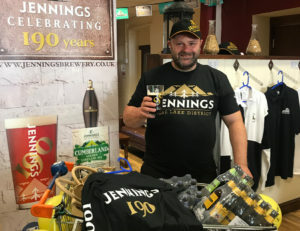 On the 190th day of the year on their 190th birthday year, Jennings brewery opened its doors to one lucky winner to help join in the celebrations of 190 years of brewing. 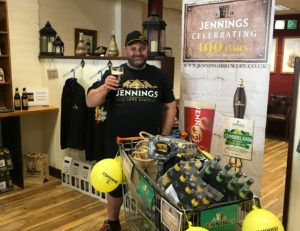 Sean Banks, who won a competition on Jennings Facebook page by posting a picture of himself enjoying some Jennings beers, was given the opportunity only loyal Jennings drinkers can dream of. In 19 seconds, Mr Banks completed a trolley dash where he was able to grab any Jennings beer and merchandise he wanted… with no final tab! “I didn’t think I would win, you know when you enter competitions with the hope but never think it’s going to happen to you. I couldn’t believe it when they told me the news, today has been incredible…cheers Jennings and Happy Birthday.” Said Sean Banks when leaving the event with his winnings in hand. “190 years of brewing is something we are incredibly proud of and without the continuous support from our customers we wouldn’t be here today. Including our customers within this milestone celebration makes the occasion that extra bit special. Here’s to another 190 years!” Said Brand Manager from Jennings Brewery. As part of the ongoing celebrations, Jennings are also hosting a number of different events to ensure everyone is involved within the festivities. Following the success of the trolley dash, next on the agenda is a family fun day. Taking place in September, the event is being held at Jennings brewery and is free entry, with the first 190 guests set to receive a complementary gift on arrival. A BBQ, prosecco bar, Jennings real ale bar, brewery tours and live music are all set to be included, making it a party you’ll not want to miss!